Rhossili Bay Beach01792 468321work BeachRhossili Bay is the first beach to be awarded Britain’s Best Beach by TripAdvisor’s Travellers’ Choice for the second year running, not to mention the 3rd best beach in Europe and 9th best in the world! Rhossili has also been described as ‘The supermodel of British beaches’ by The Independent and has also won accolades from UK Travel Writers and awards for being the best spot to have a picnic! 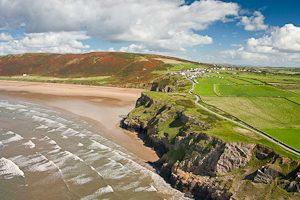 And The Times nominated Rhossili as ‘The UK's No.1 dog-friendly beach’. At low tide there is a huge expanse of beach. It is possible to walk across the bay to Llangennith or even cross onto the Worms Head. When crossing over to Worm's Head, please report to the Coastwatch Centre before you go. If your return journey is cut off by high tide, it is very important that you do not attempt to swim back to shore. There is always some sand, even at high tide. It is very popular with surfers. Many different birds nest on the cliffs, so don't forget your binoculars. There is a very steep walk down to the beach so it may not be suitable for pushchairs or anyone who has difficulty walking. Refreshments and parking 400 yards. Dogs are allowed. Rhossili Bay is the first beach to be awarded Britain’s Best Beach by TripAdvisor’s Travellers’ Choice for the second year running, not to mention the 3rd best beach in Europe and 9th best in the world! Rhossili has also been described as ‘The supermodel of British beaches’ by The Independent and has also won accolades from UK Travel Writers and awards for being the best spot to have a picnic! And The Times nominated Rhossili as ‘The UK's No.1 dog-friendly beach’. From Swansea take the A4118 Port Eynon road; at Scurlage, turn right onto the B4247 (signed for Rhossili) and continue on this road to the village and car park on left.